last january at about this time i had just started my flickr site to keep track of my overall knitting and thesis. about mid year i started my etsy store. this year i feel that it is time to move on and ramble a bit more about knitting on a blog. i was never sure about flickr, since it’s supposed to be for photos… and so now i have a space. welcome to my new blog! make yourself at home. feel free to try on the handknits. 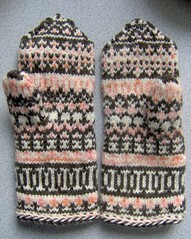 This entry was posted in knitting, mittens, thesis by cosymakes. Bookmark the permalink. I am thrilled that you started a blog, Cosy. I love seeing your work on Flickr. Welcome to the world of blog…I look foward to your thoughts and work along the way. Wonderful mitts. I will watch your blog with interest. awww… thanks for the well wishes. we’ll see how it goes! Oh, I’m so looking forward to hearing about your theses! Seen your work on flickr for yonks but never said much, guess I was too in awe of your knitty talent! I too am glad to see you blogging. I am interested in reading your thoughts about knitting, and it is too hard to keep track of words in flickr.